Stoke City defender Danny Collins has said he will do everything he can to keep his place after forcing his way back into the team in recent weeks. The 29-year-old lost his place at the start of the year, but has started the last three Premier League matches. Collins told BBC Radio Stoke: "I'm not going to lie and say that I don't mind sitting on the bench, but there's been injuries and I've got back in. "I'm pretty pleased with the way things have gone in the last couple of weeks." 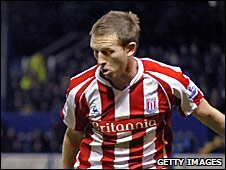 Wales international Collins, a £2.75m signing from Sunderland in September 2009, has made 20 starts in all competitions since moving to the Britannia Stadium. The Potters host Tottenham on Saturday, and Collins says Stoke can still make it into the top 10 by the end of the season. "I think Birmingham and Fulham are just above us and it would be good to get amongst those two in the last nine games," he said. "We have to have a little look over our shoulder at the teams below us, but the lads in the squad are looking up." Ryan Shawcross will return to the squad for the game on Saturday after serving a three-match suspension for his red card against Arsenal.